I’m getting ready for fresh blueberries with this recipe. It was perfect and the cheesecake is so smooth and the crust was so buttery. Trust me, they’re very addicting! I loved the addition of the orange zest in the cheesecake. And to top it off…today’s National Blueberry Cheesecake Day! PERFECT! Preheat oven to 350 degrees. In a small saucepan, combine the sugar, cornstarch, orange juice and blueberries. Cook over medium heat until the sauce thickens and comes to a bubble. Remove from heat and set aside. In a large bowl, mix the flour and powdered sugar. Cut in the cold butter until the mixture is crumbly. Line two 8×8 or one 9×13 pans with foil or parchment paper. Press the crust into the bottom of the pan. Bake for 20 minutes until the crust is lightly browned. While the crust is cooking, cream together the cream cheese and sugar. Add the flour, eggs, vanilla and orange zest and mix well. Remove the crust from the oven and pour the cream cheese mixture over the hot crust. Spoon the blueberries over the cream cheese mixture. 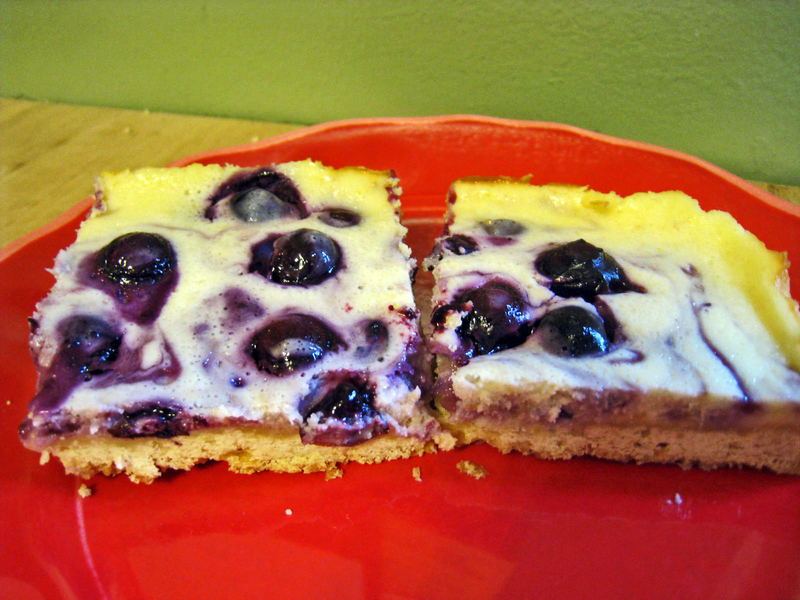 With a knife, swirl the blueberries throughout the cream cheese. Bake the bars fpr another 20 minutes or until the bars are set. Let the bars cool on a wire rack for 1 hour. Once cooled, refrigerate the bars for at least an hour or overnight. Cut into squares and serve cold.